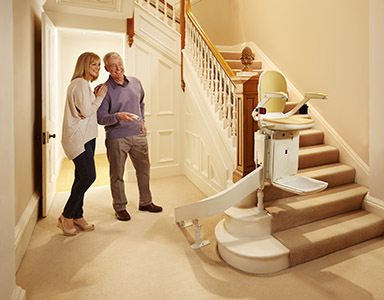 Acorn Superglide Stairlifts have some of the most technologically advanced stairlifts available, helping thousands of people worldwide to reclaim full access to their home. It’s the safe, comfortable and simple solution to difficulty with the stairs. Every aspect of the Acorn Stair lifts have been designed with the highest standards of comfort and safety. Acorn's years of experience have helped to create stairlifts that are built purely with the user in mind. Acorn was formed in 1992. We started by buying, reconditioning and reselling stairlifts from other stairlift makers. In a short space of time, demand outstripped supply and so we decided we needed other supply options to maintain our commitment to exceptional customer service. Acorn's stairlifts are designed to be customer focused, simple, easy to install and maintain. Acorn have motor and gearbox manufacturing facilities based in Scotland. This ensures complete control over the quality and technology of the most importance piece of any stairlift.